This bottle of 1992 Domaine Drouhin Laurène Pinot Noir is the latest example. It was purchased by me upon release, probably in 1994, and kept in my cellar ever since. It is certainly one of the first, if not the very first vintage for this reserve offering. 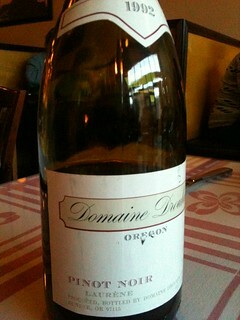 I pulled the cork on it last night, at dinner with my friend Kevin Pogue and our wives. We were celebrating the start of a couple of excellent projects (which shall remain nameless for the moment), and decided to dine at the Whoopemup Café here in town. I brought along the bottle of DDO, hoping for the best. It was better than that. As with some of the other, not quite as old Oregon Pinots I’ve opened in recent weeks, this wine was in superb condition. Quite alive, mature, complex, fragrant and deep, it breathed open quickly and held itself together throughout the course of more than an hour. As the last of it was consumed, the wine was nowhere near faded. Although I have tasted and reviewed thousands upon thousands of Oregon Pinots over the years, I can’t think of another one that showed better at almost 20 years of age. It speaks to the skills of the Drouhin family, the power of the Red Hills terroir, and the ability of wines to survive a certain amount of jostling over the years. My friend Pogue called it truly Burgundian in the best sense, and I would have to agree. It was indeed a marvelous, almost miraculous wine. +1 here on the DDO being age-worthy and Burgundian (in a good way). At Christmas lunch with my brother I brought a 2002 DDO Laurene and he a 2003 Houdelot Romanee St Vivant. We decided the wines were a tie; the Laurene perhaps slightly better to taste, but the Romanee St Vivant slightly better aromatics. Both wines were outstanding and had years in front of them.